Congratulations on getting engaged! I am so excited for you! I'm Beth from Bethany Howarth Photography, a relaxed and natural wedding photographer based in Christchurch and throughout New Zealand. I am not just a Christchurch wedding photographer though - I also do destination weddings! 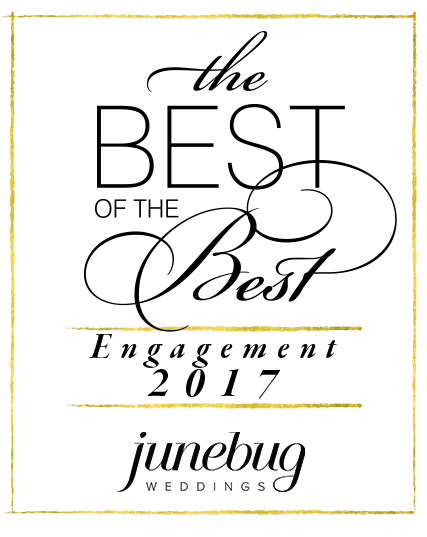 I was included on the coveted Junebug Weddings Best of the Best list in both 2017 and 2018, as one of my images was deemed to be one of the best engagement images in the world. This is one of the highest honours a wedding photographer can receive (I still cannot believe it!). Junebug is a huge wedding blog based in the USA. You can read more about this here and here. I travel a fair amount - my Instagram will tell you where I am and when! "Bethany was perfect for what I wanted to see in my wedding photographs. I love her natural documentary style and she creates stunning photos in all situations with ease. Amazing work!" My style is a mixture of natural documentary wedding photography (where I capture unstaged moments) and low key relaxed couples' portraits (no cheesy poses here). I love stunning locations, beautiful light and couples in love. I aim to capture raw, genuine moments, relaxed, romantic and natural portraits and the little details that are significant to you. Do you want a relaxed approach to your wedding photography? Then please do have a look at the galleries on this page - they showcase some of my most recent work. For more information on me as a person and my approach to photography, please check out the about me and my approach pages. "Bethany had us laughing all day and produced the most gorgeous engagement photos for us, we are so in love with them and can't express how grateful we are for her amazing professional photography, super, super gifted! Thank you again Beth!" CAPTURING NATURAL AND RELAXED PHOTOGRAPHS FOR LAID BACK COUPLES THAT TELL THE AUTHENTIC STORY OF THEIR DAY.